Based on Todarananda Ayurveda Saukhyam, this series in nine volumes covers almost all the aspects of Ayurveda, including fundamentals principles, anatomy, physiology, hygiene and public health, examination of patients, diagnosis, prognosis and treatment of diseases, iatro- chemistry, materia medica and five specialised therapies, known as Panch Karma. Vaidya Bhagwan Dash , holds graduate and post-graduate qualification in Ayurveda, in addition to Master's degree in Sanskrit and a Doctorate from University of Delhi. In the course of over thirty years dedicate to research and practice of Ayurveda, Dr. Dash has attended several international conferences and seminars held in Brazil, Mexico and France. He was invited to deliver a course of lectures in Ayurveda at the Patrice Lumumba Friendship University, Moscow and the Australian School of Ayurveda at Adelite, South Australia. Author of over twenty important publications covering different aspects of Ayurveda and Tibetan Medicine, he has to his credit an English translation and commentary of Caraka Samhita, the most authentic Ayurvedic classic. Dr. Dash was Deputy Adviser in Ayurveda to the Government of India in the Ministry of Health and Family Welfare till 1981. He has also served the World Health Organisation as a consultant in Traditional Medicines. Vaidya (Miss) Lalitesh Kashyap , obtained her Ayurvedic degree from the Ayurvedic and Unani Tibia College, Delhi and Ph.D from the K.S.D. Sanskrit University, Darbhanga. She has been actively engaged in Ayurvedic practice and research for the past twenty-five years. She has to her cred several published articles on Ayurvedic drugs, particularly those essential in the treatment of ladies and children. She worked as the Medical Superintendent of the Ayurvedic Hospital, under the Central Government Health Scheme. Though several important works on Ayurveda have been published till now, there is a large number of works which are still in the manuscript stage in libraries and could not see the light. The name of some of these works we know by coming across them in commentaries and compilations. The reason is mostly economic because the texts which are included in the prospectus are studied in institutions and get priority in publication while others lag behind. The result is that to-day teachers and students are not acquainted with even the names of such texts what of going through them. Todarananda is a work named on Raja Todaramalla, a minister of Mughal Emperor Akbar (16th Cent. A.D.). 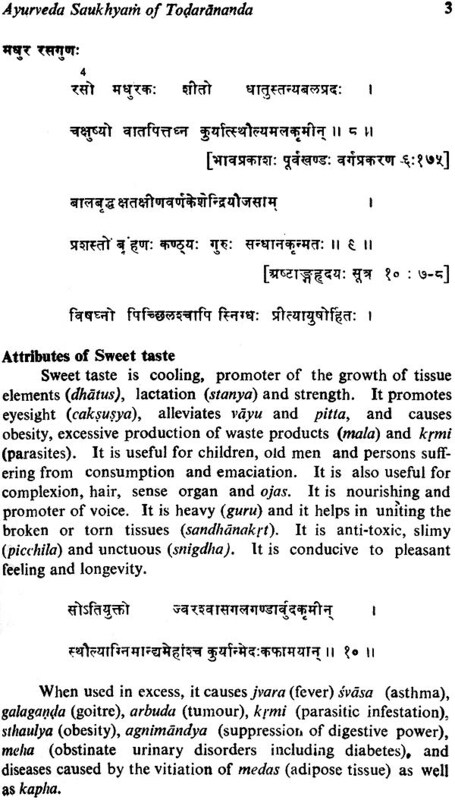 This is an encyclopaedic work having Ayurveda Saukhya as a component. Ayurveda Saukhya too is a voluminous work dealing with several aspects of Ayurveda. The present volume deals with the portion of Materia Medica which is generally known as Nighantu. In 1972, when I was editing the Madhava Dravyaguna, I had the opportunity to see a manuscript of the Ayurveda Saukhya. 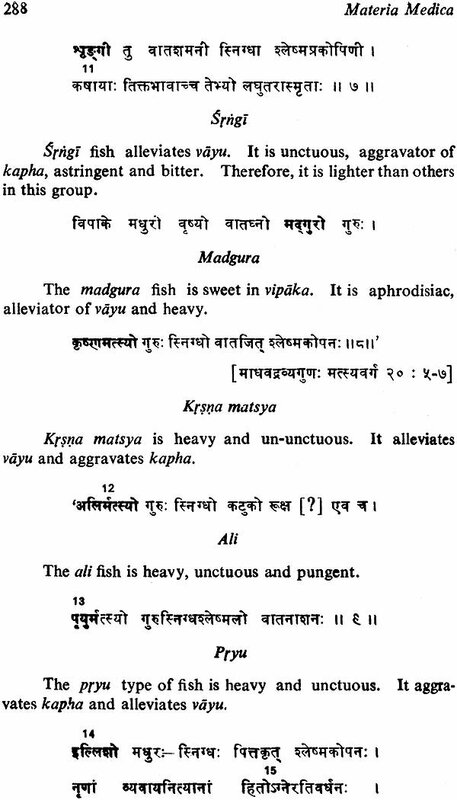 I was surprised to find that it followed Madhava's Dravyaguna faithfully in the context of Nighantu portion though the author did not mention the name of Madhava or its work anywhere. It is also to be noted that though in other portions, source books are quoted explicitly, in Nighatnu portion it is conspicuously absent. Hence, it cannot be said definitely what was the source of-this portion. It is almost certain that Madhava's Dravyaguna was quite earlier than the Ayurveda Saukhya because of its having been quoted by medieval authors and commentators like Sarvananda (12th Cent. A.D.) and Vopadeva (13th Cent. A.D.). As regards Bhava Misra, he happened to be in 16th Cent. A.D. and thus may be contemporary to the work Ayurveda Saukhya. 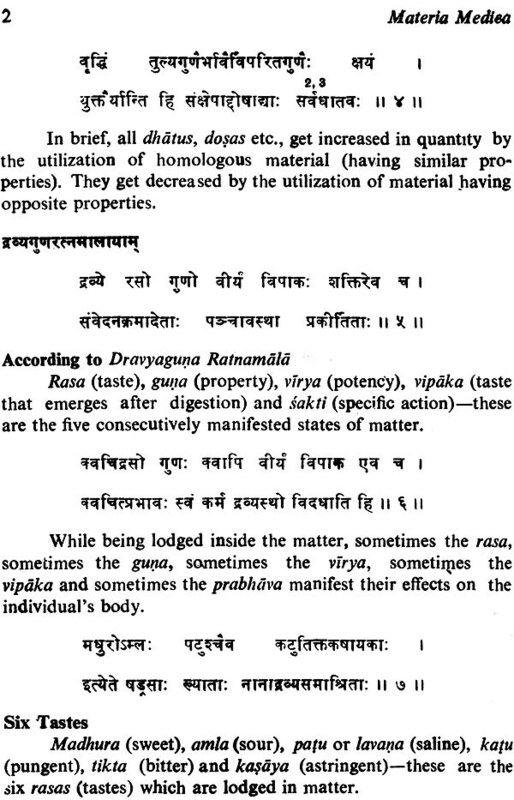 The verses of the Bhava Prakasa found in the Ayurveda Saukhya lead us to think that either these verses are later interpolations (particularly if they are not found in majority of the MSS.) or Bhava Misra himself might be associated with this work. A number of expert scholars of Banaras were engaged by Raja Todaramalla for this encyclopaedic work, and it is not improbable if Bhava Misra, a resident of Magadha (Gaya) adjoining Kashi and a renowned expert of Dravya guna himself participated in this great task. It is to be noted that Bhava Misra, apart from the Bhava Prakasa Nighantu, also composed another Nighantu entitled Guna ratna mala. Without close association, it becomes difficult to explain such situations. The possibility of a common source of both the authors, as proposed by the editor, is also not improbable. Vaidya Bhagwan Dash, the editor of this work, is well- known for his devotion to enriching the literature of Ayurveda and also to making it intelligible to the outer world. He has done this job with great labour and deserves congratulations not only of myself but of the entire circle of intellectuals interested in the study of Ayurveda. I hope, he will be able to bring out other remaining volumes so as to present a total picture of the work. There has been an increasing interest in the utilisation of the traditional systems of medicine for promotive, preventive and curative health services in many countries of the world. Ayurveda is perhaps the oldest traditional system of medicine in India catering at present to the medical needs of a large section of both the urban and rural population of this country. This system of medicine has also caught the attention of medical practioners in the West. The Materia Medica of ayurveda represents a rich storehouse of knowledge of drugs based on centuries of experience, Scientists, research workers, physicians and students interested in ayurveda, often experience great difficulty in obtaining authentic works on the subject with a translation in a language generally understood by them. To cater to this long felt need, we are happy to present here the Materia Medica of Ayurveda by Raja Todaramalla with its English translation along with critical notes. Todararnalla hailed from Oudh in Uttar Pradesh, India. He was the dewan (Minister) under the great Moghul Emperor Akbar who ruled during the sixteenth century A.D. The -emperor was well known for his secular outlook. Todararnalla, in spite of his unquestioned loyalty to this Muslim emperor, was a staunch follower of Hinduism. It was apparent to him that Hindu culture in India was in a decadent state and at a low ebb. Quite apart from religion, even sciences like astrology and medicine had fallen into disrepute. Very little original work, if any, was being done in these areas of knowledge and even the extant texts on various subjects were falling into disuse. Such of them as were available had been mutilated and subjected to unauthorised interpolations with the accretion of superstitious ideas through the centuries. In his mission to revive and revitalise Hindu culture both in the religious and secular fields, he took the help of several eminent Sanskrit scholars of Varanasi and composed encyclopaedic works on 23 different subjects by collecting material from authentic texts which were then available. To this, the added knowledge and experiences of the experts in the subject were incorporated. Most of the original texts which were then utilised for the composition of these works are no more extant and those which have survived the vicissitudes of time are now in a mutilated form with several unauthorised and erratic interpolations. It is in this context, therefore, that today Todarmalla's work has gained considerable importance, and it is for the first time that the Materia Medica portion of his. 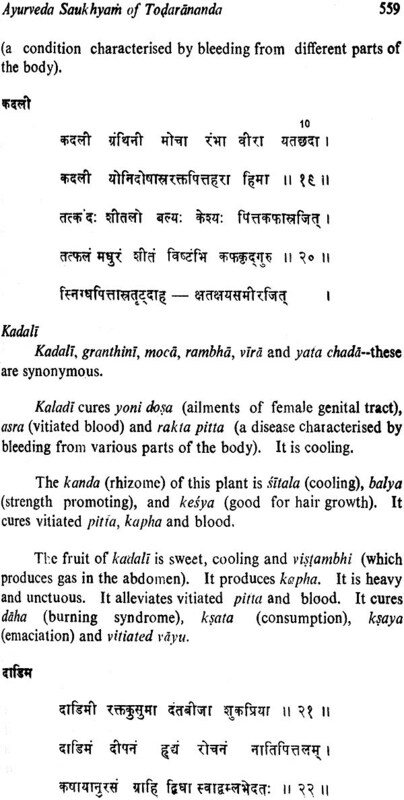 encyclopaedic work on ayurveda is being brought under print. The series of works on 23 topics of Hindu culture composed under the auspices of Raja Todaramalla is called Todartinanda which means "the delight of Todararnalla". The term saukhyam meaning "happiness" is suffixed to the name of each text on a particular topic. Thus the text on ayurveda is called Ayurveda Saukhyam. This Ayurveda Saukhyam comprises several chapters each one of which is called harsa meaning "pleasure" . In the beginning of each harsa, mangaldcarana or the auspicious invocation in the form of a prayer to God is furnished. The colophons at the end of each chapter indicate the contents and chapter number, among others. These invocations-and colophons are missing in some manuscripts. Calligraphic errors have not left this monumental work untouched. Six different manuscripts collected from various libraries of India and Nepal were utilised for the collation and editing of this work. Some of these manuscripts are incomplete. But in others which appeared at first to be complete, some chapter numbers have been arranged and named differently. Some chapters have also been omitted in some of these manuscripts. Therefore, while editing, it was felt desirable to serialise and renumber all these chapters making up a total of 97. This was a delicate job to perform because at the end of the chapters, in some manuscripts, the colophons are missing. For the preparation of this work on Materia Medica, ten chapters of Ayurveda Saukhyam have been utilised. On the basis of the remaining chapters, it is contemplated to prepare separate volumes on different topics shortly and these "texts will be in the hands of scholars gradually and in stages. Ayurveda Saukhyam deals with various topics of ayurveda including fundamental principles, anatomy, physiology, hygiene and public health, examination of patients, diagnosis, prognosis and treatment of diseases, iatro-chemistry and materia medica. Materia Medica and allied topics are found scattered in ten different chapters of this work. The eighth chapter deals with the properties of drugs. This chapter is available in five out of the six manuscripts consulted. In one manuscript, however, this chapter is left incomplete. This eighth chapter inter alia deals with some extraneous topics like vamana (emetic therapy) and virecana (purgation therapy). 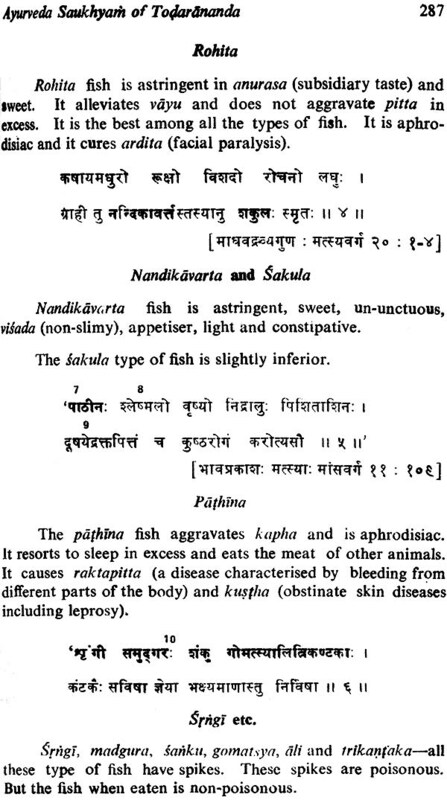 These topics, along with other allied topics, like snehana (oleation therapy), svedana (fomentation therapy), niruha and anuvasana (medicated enema), nasya (inhalation therapy) and rakta moksana (bloodletting) are described in detail in the 85th to 88th chapters of the edited text. It is proposed to bring out a separate volume on these topics, which taken together, are called pancakarma therapy. These extraneous topics, therefore are excluded from this work. This 8th chapter of the original text is divided into 29 chapters in the present work-one chapter dealing exclusively with one group of items. The 12th chapter of the original text deals with the description of various groups of drugs collected from classics like Susruta Samhita. This chapter is, therefore, included in the 30th chapter of the present work. This chapter is available in three manuscripts. There are of course, separate texts on the synonyms of drugs of ayurveda. But most of the extant ayurvedic works on materia medica invariably provide synonyms of drugs along with their properties. It is keeping in view this tradition of ayurveda, and also in order to make the present work more useful to research workers, physicians and students that these eight chapters have been included here. All the manuscripts procured- for the editing of this work were full of grammatical and syntactical errors. Some of these mistakes were common to all the manuscripts. Even the arrangement of topics in these manuscripts varied considerably. Many terms and suffixes used in this work do not stand correct according to the tradition of Panini's grammar. The readers will find some such terms even in the present publication. It is likely that these mistakes were there in the original texts from where references were collected and the scholars who did the job did not think it proper to make any change. The other possibility is that these errors were introduced by subsequent calligraphers. There are some orthographical peculiarities in all the manuscripts of this work. In several places na has been used in the places of na, sa in the place of sa and sa, ba in place of va, kha in the place of sa, ja in the place of ya, ra in the place of la, gha in the place of dha and vice versa. In several places the consonants after ra are duplicated. While editing this work, the variant readings (which include some grammatical errors also) are given at the end of each chapter under Notes and References and the original manuscripts are referred to as adarsa pustika. Some topics given in this work are also available in other extant ayurvedic works. The variant readings in these texts are given at the end and these extant texts are referred to as akara. Some portions of the manuscripts were so corrupt and incomplete that we did not think it proper to include them in the main text" In view of their significance from the materia medica point of view, they are given in the "Notes and References" at the end of the chapters. In the manuscripts some texts are originally referred to by name from where the information was collected by the scholars. The readings in these texts bear a striking resemblance to those of Madhava dravyaguna and Bhava prakasa. The former has been edited by Prof. P.V. Sharma and published by Chawkhamba Vidya Bhawan, Varanasi in 1973. References to these works are conspicuous by their absence in the original manuscripts. However, to facilitate research and study on this subject, these references are provided in the present work in square brackets [ ]. Since the names of these texts are not described in the original manuscripts, it is very difficult to determine as to who borrowed from whom. It is also very likely that both have' borrowed their texts from a third source which has since become extinct. While providing the English translation of the text, we have been very conscious of avoiding mistranslation. 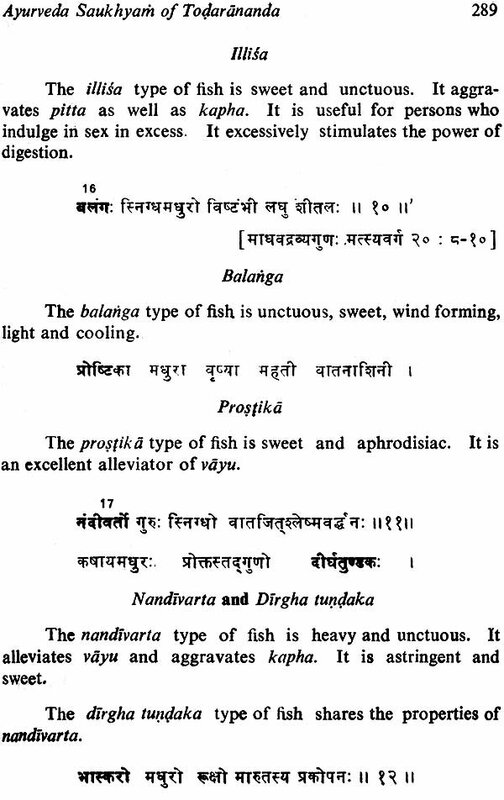 Where equivalent English words are not available, in the English text, the Sanskrit words have been transliterated as such and printed in italics. The glossary appended to this work provides a brief explanation of such terms. The nearest English equivalents of many such technical terms are given in parentheses in the English text itself. 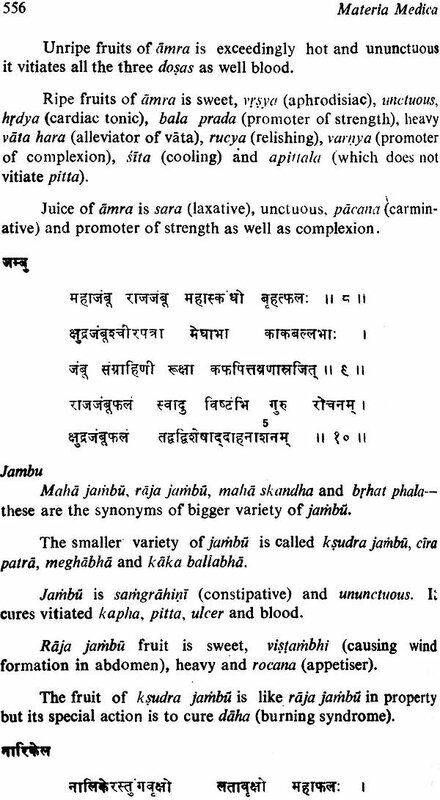 The botanical names of most of the medicinal plants are given in parentheses against the Sanskrit names of drugs in the side-headings. Similarly, the English equivalents of animals, metals, minerals, etc., are provided. Wherever there is any controversy regarding the correct indentification of a drug, the botanical or English names have not been provided, lest the reader should be misguided. One manuscript of this work was procured from a private individual of Varanasi. Some scholars had attempted a Hindi translation of this work. From the language and the paper, it appears that this attempt was not of recent origin. In some places, this Hindi translation has been consulted to decide upon the exact reading of the text. The history of the materia medica of ayurveda is as old as the Vedas. The Rk Veda (prior to 4500 B.C. ), which is the oldest repository of human knowledge, has described about 67 plants. Other Vedas, namely, Saman, Yajus and Atharvan are also replete with references to various aspects of ayurveda, including the description of drugs and their therapeutic effects. Medicinal plants are also described in the samhita, upanisat and purana texts. (8) Vajikarana tantra or Science of Aphrodisiacs. Classics were composed on each of these specialised branches. 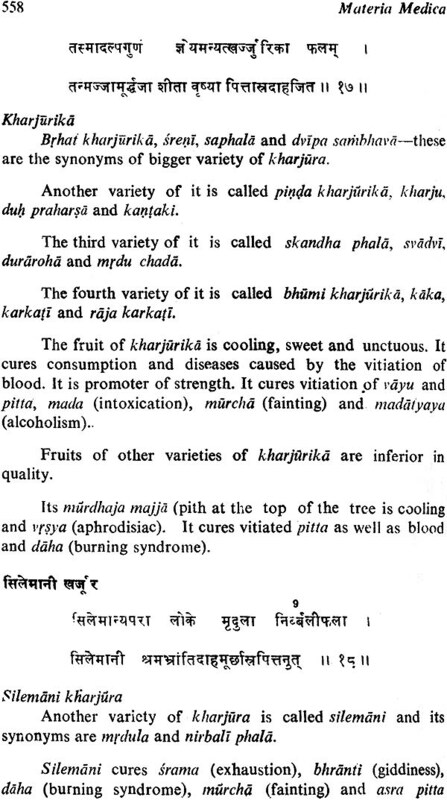 In some classics, all these branches of ayurveda were put together. Prior to the seventh century B.C., many ayurvedic classics were composed. The important ones, among them, are Caraka samhita, Susruta samhita, Bhela samhita, Kasyapa samhita and Harita samhita, Most of these texts are not available in their original form now. 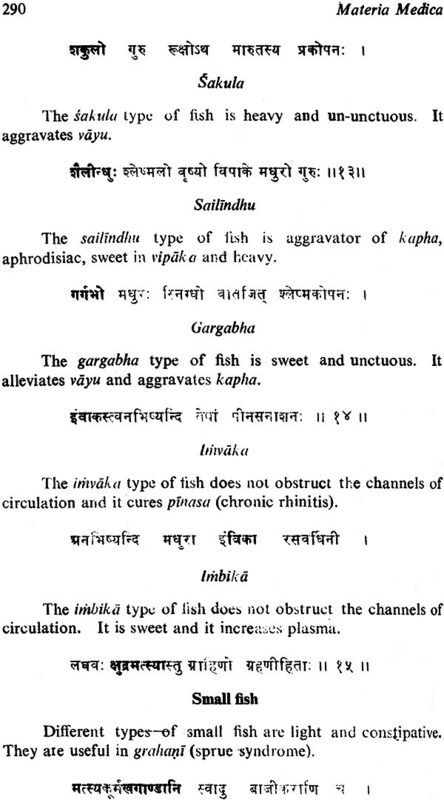 Caraka samhitd, which was originally composed by Agnivesa and was called Agnivesa samhita, was subsequently redacted by Caraka. Even this redacted version is not available in its entirety now. Out of 120 chapters, about 41 chapters were missing and were subsequently added by a fourth century scholar named Dr dhabala. Susruta samhita was also redacted by Nagarjuna. The remaining three texts are not available in their complete form. Harita samhita, which is available now, appears to be different from the original one. Subsequently, two texts of Vagbhata, namely, Astanga hrdaya and Astanga samgraha were added to this series of classics and both these works are available in their complete form. In all these important ayurvedic classics, separate chapters are provided for the description of drugs and their therapeutic properties. The fundamental principles dealing with the concept of drug composition and drug action are also described in these texts. Dravya guna or materia medica, as a separate' text, came into existence much later. The advent of Buddhism in India brought considerable change in the practice of ayurveda. Surgery, the performance of which is invariably associated with pain, was treated as a form of himsa or violence, and therefore, its practice was banned. To compensate this loss, and to alleviate the sufferings of ailing humanity, more drugs were added during this period to ayurvedic materia medica. Prior to this period, metals and minerals were no doubt used for therapeutic purposes. 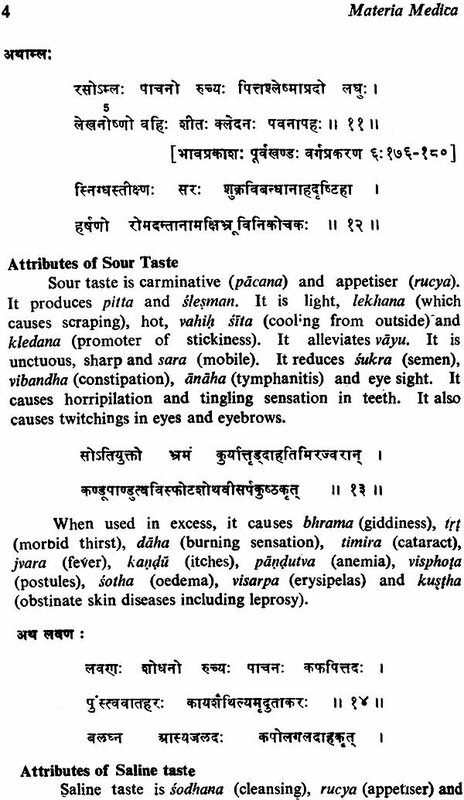 But their use was in a crude form and they were sparingly used, Buddhist scholars added considerably to the metals and minerals in ayurvedic materia medica, inasmuch as Rasa sastra or Iatro-chemistry, formed a specialised branch and many authentic texts were composed on this subject. Thus, the loss by discarding the practice of surgery was well compensated by the addition of iatro-chemistry to the materia medica of ayurveda during this period. Some of the Buddhist rulers, like Asoka, established several herb-gardens, so that people could get drugs conveniently for the treatment of their diseases. Buddhist monks were encouraged to learn ayurveda and practise it, which was considered to be the most convenient and popular method of spreading the teachings of their Preceptor. Thus, through Buddhism, ayurveda spread to Sri Lanka, Nepal, Tibet, Mongolia, the Buriyat Republic of Soviet Russia, China, Korea, Japan and other South-East Asian countries. Ayurvedic texts, including texts on materia medica, were translated into the languages of these countries and these are stilI available in translated form even though some of their originals have become extinct in the country of their origin. Based upon the fundamental principles of ayurveda, some local herbs, diet and drinks were included in the traditional medicine of the respective countries. The materia medica of ayurveda was thus enriched . India was severally invaded by outsiders like the Greeks, the Saks and the Hoons, When these -people came into contact with the rich tradition of India, especially the medical science, they carried back with them medicines and doctors. Indian doctors who went with them, translated ayurvedic texts into their languages. The new drugs which were specially used in those places were incorporated into the ayurvedic pharmacopoeia. Such repeated exchanges of scholars enriched ayurveda and its materia medica. Through commercial channels ayurvedic drugs and spices were exported to these countries and they were held in high esteem there. Several universities were established during this period for imparting theoretical and practical training in different religious and secular subjects. Taxila and Nalanda were the two such universities which attracted not only intellectuals, from different parts of this country but many from abroad. In Taxila, there was a medical faculty with Atreya as its Chairman. In Buddhist literature, there are many interesting stories and anecdotes about the activities of these universities, their scholars and faculty members. One such anecdote is related to Jivaka who was three times crowned as the King of Physicians because of his proficiency in the art of healing. He was an expert in paediatrics and brain surgery. It was the practice at that time for candidates desirous of admission to the faculty in the university to appear for a test before the Dvarapala or the gate-keeper. 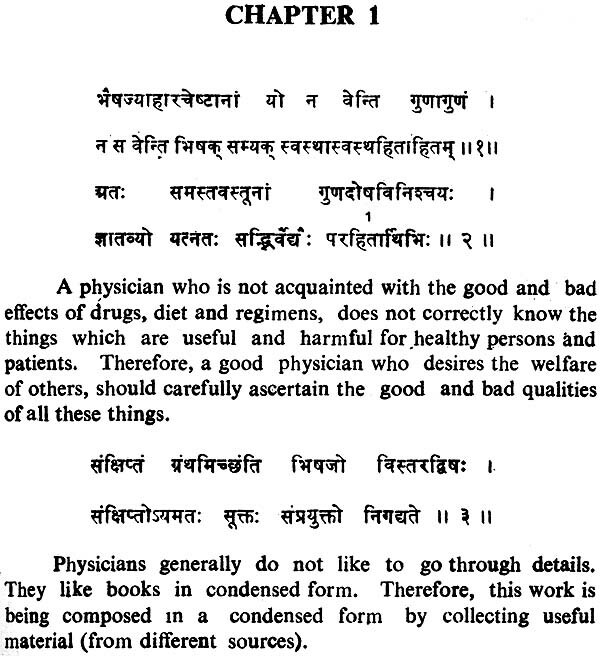 Jivaka and several other princes had to face these tests before being considered for admission to the medical faculty. They were asked to go to the nearby forests and collect as many plants as possible, which did not possess any medicinal property. By the evening candidates returned with several plants which they considered to be free from medicinal properties. Jivaka did not return for several days and, when he did, he was empty handed. On a query from the gate-keeper, Jivaka replied, "I could not find any plant, or for that matter anything which does not have medicinal value." He alone was selected for admission to the medical faculty. This was the status of knowledge of the candidates for the medical faculty at that time. This was the time when the knowledge of materia medica became highly developed.